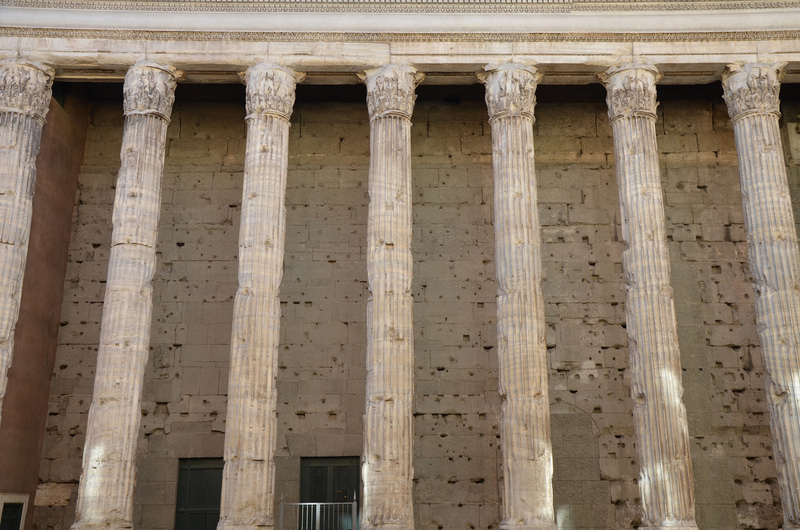 Just a short walk from the Pantheon, in Piazza di Pietra, are the majestic remains of the Temple of the deified Hadrian (Hadrianeum) built by Antoninus Pius, Hadrian’s adopted son and successor. Of the original temple, only eleven columns with capitals and the cella wall are still visible today. The remaining columns of the Temple of Deified Hadrian (Hadrianeum), Campus Martius, Rome. 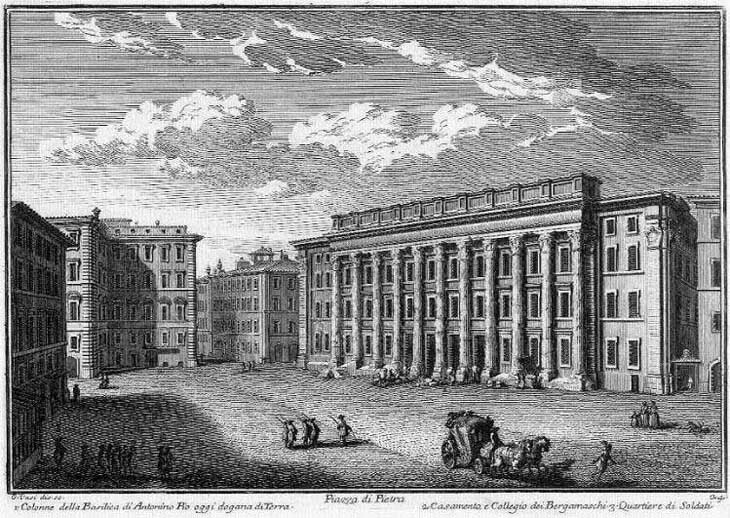 In 1696, during the pontificate of Pope Innocent XII, the surviving part of the temple was incorporated into a large building designed by Carlo Fontana to house the central Customs Office. In 1879-82 the building was modified and its Baroque decoration was replaced by a simpler one; in 1928 the wall of the cella was freed from later additions. 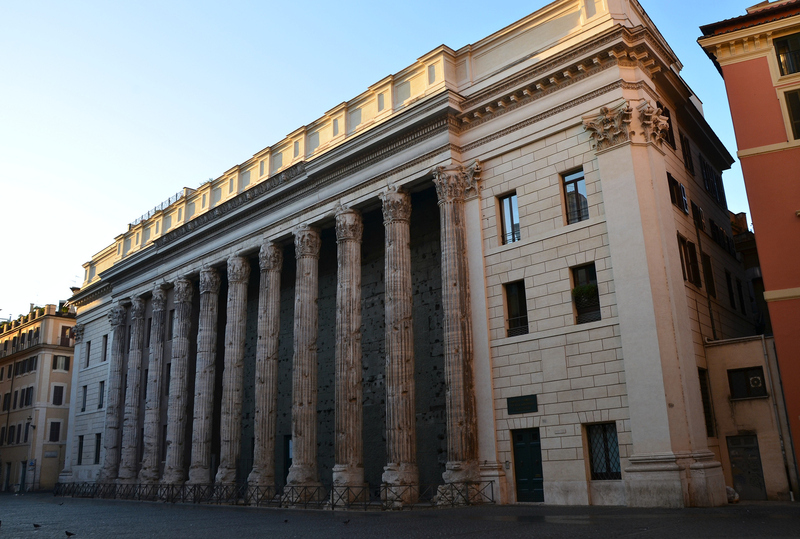 Today the building houses the Borsa Valori di Roma, Rome’s stock exchange. The north side colonnade and the cella wall of the Temple of Deified Hadrian (Hadrianeum), Campus Martius, Rome. The temple to the divine Hadrian was erected in the Campus Martius (Field of Mars) and was dedicated in AD 145. The order is Corinthian and the columns are 15-metre-high and made of Proconnesian marble with its characteristic greyish colour. Only the lower part of the entablature is left from the original (the highest section being a reconstruction). 16th and 17th-century drawings show how the edifice looked like when the original entablature was still in place. The entablature resting on Corinthian capitals, Temple of Deified Hadrian (Hadrianeum), Campus Martius, Rome. The cella and columns (part of the north side of the temple) stand upon a stylobate and large podium. A deep excavation in front of the colonnade has exposed the original ground level of the temple precinct, 5 meters below the present floor level. The stylobate and podium of the Hadrianeum, Campus Martius, Rome. Several excavations between the sixteenth and twentieth centuries in the vicinity of the temple have identified the line of a monumental wall in peperino tufa running parallel with the northern flank of the temple. This wall was part of a large enclosure wall that formed the temple’s porticus. During these excavations, a series of marble reliefs were also discovered. A recent theory suggesting that they adorned the attic of the portico has been favoured by scholars. However various other theories have been offered; the attic of the temple, the temple podium or the outer temple portico. Nineteen panels survive from what was potentially a much larger series. They were carved in relief with personifications of provinces altered with depictions of captured arms and armour. The reliefs were found without any inscriptions but each figure was wearing and carrying distinctive costumes and attributes. Scholars have attempted to name the provinces they were meant to represent, but unfortunately, they have not all been successfully identified. The panels are on display in five different collections in Rome and Naples. Seven provinces and three reliefs with trophies are prominently displayed in the courtyard of the Palazzo dei Conservatori in Rome (Capitoline Museums). Representation of one of the Roman provinces, perhaps Moesia or Thrace, relief from the Hadrianeum, Capitoline Museums. Representation of one of the Roman provinces, perhaps Achaia, relief from the Hadrianeum, Capitoline Museums. 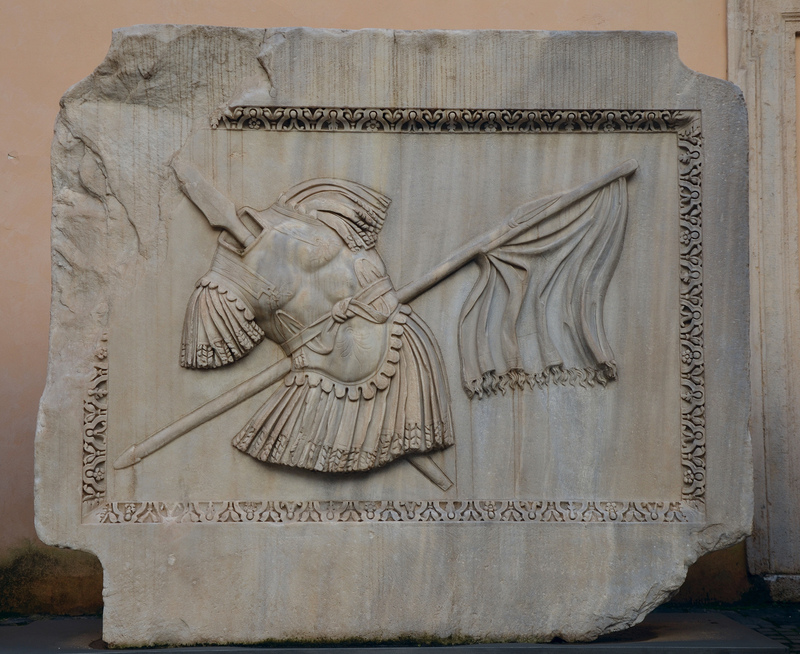 Trophy of arms (armor, lance and flag) relief from the Hadrianeum, Capitoline Museums. Representation of one of the Roman provinces, perhaps Mauretania, relief from the Hadrianeum, Capitoline Museums. 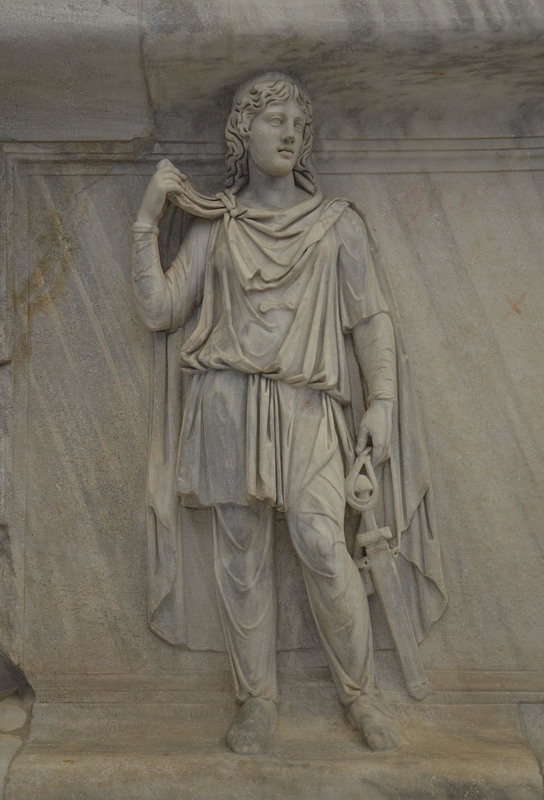 Representation of one of the Roman provinces, perhaps Gallia or Germania, relief from the Hadrianeum, Capitoline Museums. 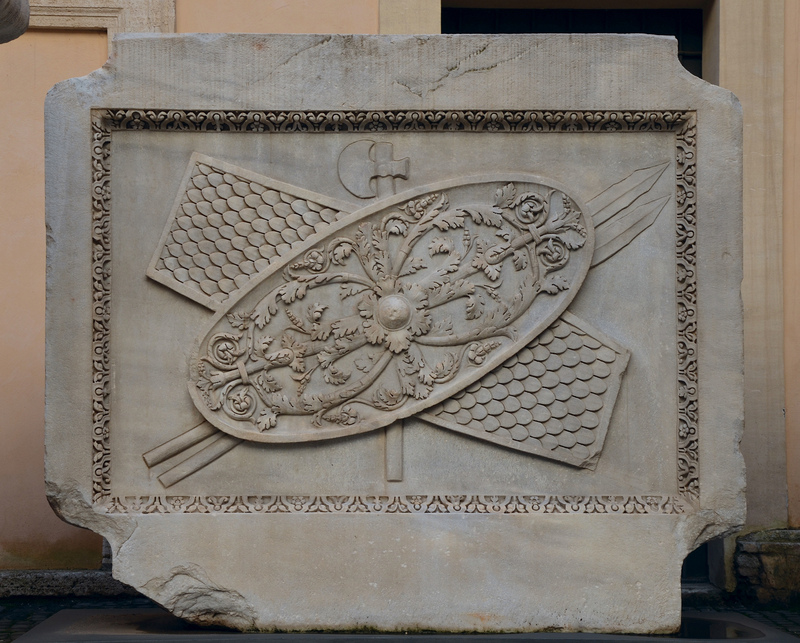 Trophy of arms (shields, ax and spears) relief from the Hadrianeum, Capitoline Museums. Representation of one of the Roman provinces, perhaps Hispania, relief from the Hadrianeum, Capitoline Museums. 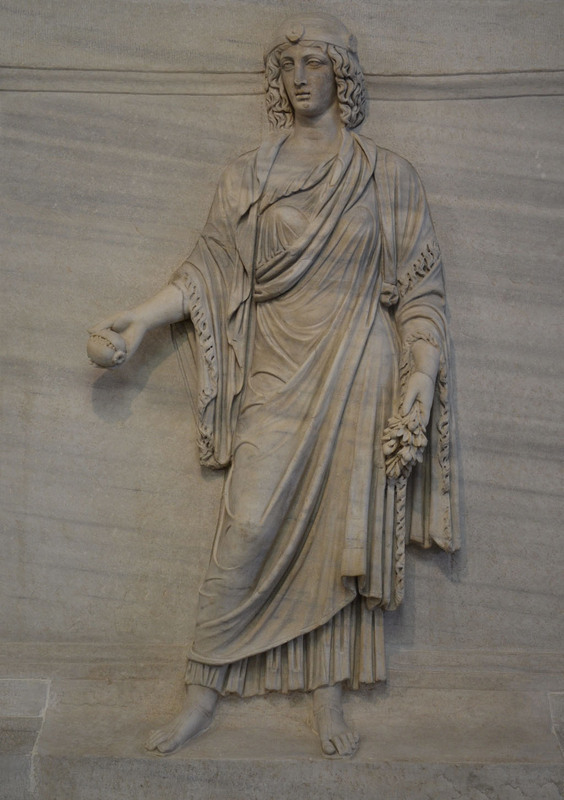 Representation of one of the Roman provinces, perhaps Bithynia or Dacia, relief from the Hadrianeum, Capitoline Museums. 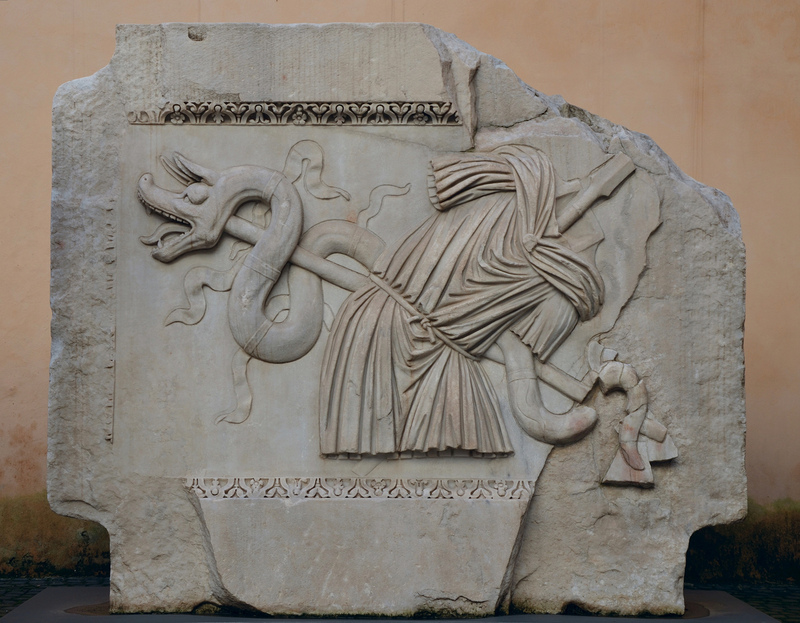 Trophies of arms (tunic, short spear, captured Dacian Draco) relief from the Hadrianeum, Capitoline Museums. Representation of one of the Roman provinces, perhaps Dacia, Libya or Numidia, relief from the Hadrianeum, Capitoline Museums. Two restored panels with the personification of provinces are housed in the Palazzo Massimo alle Terme. Representation of one of the Roman provinces, perhaps Egypt, Palazzo Massimo alle Terme, Rome. Representation of one of the Roman provinces, perhaps Thrace, relief from the Hadrianeum, Palazzo Massimo alle Terme, Rome. Another tree reliefs with the personification of provinces and two with trophies are housed in the Naples Archaeological Museum. Representation of the Roman provinces and trophies of arms, reliefs from the Hadrianeum, Naples National Archaeological Museum. Representation of one of the Roman provinces, Parthia or Armenia, relief from the Hadrianeum, Naples National Archaeological Museum. Representation of one of the Roman provinces, perhaps Scythia or Noricum, relief from the Hadrianeum, Naples National Archaeological Museum. Representation of one of the Roman provinces, Phrygia or Bithinia, Naples National Archaeological Museum. The other known elements are scattered in several Roman collections or lost, but are known from drawings from the Renaissance and later periods. The choice to represent the personifications of Provinces within a temple dedicated to the divine Hadrian had a very specific propaganda meaning; these “Provinciae Fideles” were the symbol of political order and of a pacified empire, the clearest beneficiaries of Hadrian’s foreign policy of pacification and unification. Temple of Deified Hadrian (Hadrianeum), Campus Martius, Rome. Fabulous post Carole. The Museum exhibits are beautiful ! I love sharing your journey with you Thank you. Is it possible, at all, for the reliefs to be restored to the building they came from? Is all that is left of the Hadrianeum that amazing colonnade ? These are great photos, Carole – it’s really good to see all the disparate parts brought together. I’m adding the Hadrianeum to my expanding ‘must go back and see’ list! I remember seeing this last trip, shame only a little still exists. Thank you for the excellent commentary.